The first level of license for learning to fly is your PRIVATE PILOT’S LICENSE. Private pilots can fly a variety of aircraft and travel almost anywhere in the United States. A private pilot certificate is like a driver’s license. It allows you to fly almost anywhere in the United States and even outside the United States when you comply with regulations of the foreign country where the aircraft is operated. You can carry any number of passengers, and you can share certain operating expenses with your passengers. A private pilot has fewer limitations than a recreational or sport pilot. Although there are currency and medical requirements to make sure you stay proficient and healthy, only a few other factors affect when and where you can fly. Once you earn your license, you are free to wander around in the skies below 18,000 feet to your heart’s content. You might take the family on a trip to see relatives in a distant state or use an airplane to shorten the time it takes to make business trips to another city. One restriction to a private pilot’s freedom of flight comes from Mother Nature—the weather. You can fly in some weather conditions but not others, at least without additional training. As a private pilot, you can’t fly in the clouds unless you earn an instrument rating: If it’s raining outside and you can’t see the neighbor’s house through the fog, you shouldn’t be wandering around in the sky unless you’ve been trained in the fine art of flight in instrument meteorological conditions. With a private pilot certificate, you can fly at night as long as you have received the required night training. Training for night flying is almost always included as part of a private pilot training curriculum. Without a doubt, a crystal-clear, moonlit night is one of the most spectacular and beautiful times to fly. Most pilots start out with their private pilot certificate. Be 16 years old to fly solo. Hold at least a third-class medical certificate for private and recreational certificates. Sport pilots must hold at least a current and valid U.S. driver’s license. In your practical test, or checkride, you’ll bring together elements from every aspect of training to prove your aviation skills and knowledge by talking to and flying with an examiner. It’s the last step to earn your pilot certificate, but your journey as an aviator has only just begun. What skills and requirements are needed to learn to fly? A large dash of common sense and the willingness to defy gravity in a heavier-than-air flying machine are a good start. From there we can follow the FAA’s established grocery list of requirements. The requirements for pilot certificates are found in the federal aviation regulations (FARs) available at Nashville Flight Training and online. Within this hefty book, certification has a section all its own with the charming title “Part 61 — Certification: Pilots, Flight Instructors, and Ground Instructors.” Part 61 also includes the privileges and limitations of each certificate or rating. We all start out as student pilots. Before flying solo in the aircraft, you’ll need to have in your possession a student pilot certificate. Aeronautical knowledge includes diverse and interesting subjects like aerodynamics, how the systems of the airplane you are flying work, what weather to avoid, FAA regulations, and more. The FAA requires that you pass a knowledge test covering these subject areas with a grade of 70 percent or better. 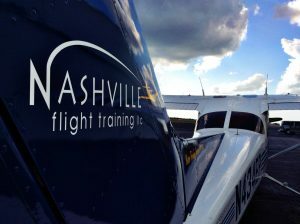 You can study at home with the help of books, videos, or computer training programs; and Nashville Flight Training offers ground school classes to help you learn the principles covered in the test. Studying topics such as navigation, aerodynamics, and weather while you’re on the ground also can help you apply what you’ve learned in the air. Throughout your flight training journey, don’t be afraid to ask questions. Your instructor may be able to describe a difficult concept in a way that’s easier to understand. Call us at 615-366-9192 and let us help you achieve your private pilot’s certificate.